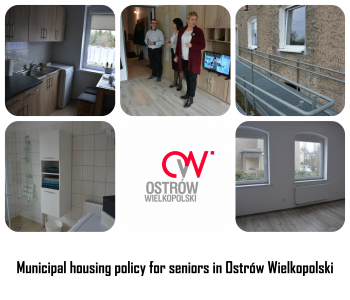 Ostrów decided to implement the 1st sheltered flat in order to offer support to seniors who require assistance in everyday functioning, but don’t have support from their family, and doesn’t need service 24/7. The first sheltered flat was created in 2017. The town acquired external funds for it. The town covers the cost of maintaining tenants for 2 years. It is inhabited by 4 seniors, chosen by a social worker. As part of the project, they can benefit from the support of environmental guardian, rehabilitator, psychologist. At the same time, they are prepared for independent functioning in local environment. The apartment is an alternative to the Social Welfare Home. In a sheltered apartment, the older person retains independence, yet can count on the help of specialists. Municipal housing adapted to the needs of seniors and people with disabilities is carried out in 2018. Co-financing from Bank Gospodarstwa Krajowego was acquired for the implementation of the task. Apartments are built in 2 buildings and are adapted to the needs of seniors (lift, wide corridors). They are in the town centre, close to church, bus stop. There will be 14 flats. To find out seniors’ needs, they are involved in a needs assessments. In Ostrów Wielkopolski there is a City Senior Council. It is an advisory body of the authorities of the town which consists of 8 members (seniors) elected by non-governmental organizations. The Council formulates their opinions on strategic and current plans of the town, and proposes its own ideas; the Senior Council is involved in the creation of the senior policy in Ostrów Wielkopolski. The needs of seniors are consulted during meetings of this council. The aim of the project is to support the autonomy of seniors, as well as to provide them with housing that they might otherwise be missing. How collaboration worked: The project is carried out by the local authorities of Ostrów Wielkopolski (The Mayor of the city and The City Council) , which implement and coordinate its activities. With regard to the “sheltered housing” program, the choice of tenants is made on the basis of applications obtained from social workers of the Municipal Social Welfare Center and on the basis of the list of persons interested in taking part in the project. The list of those interested in taking part is prepared by the social workers of Municipal Social Welfare Center who takes into account: 1st – the general criteria of the project that are: a person has to be 60+, disabled or chronically ill or need help in everyday functioning. 2nd - Once the list is prepared, decides the sequence of applications. The town acquired external funding for the project from the Wielkopolska Regional Operational Program for the years 2014 - 2020. The acquired funds will the project to be financed for the first two years of its implementation. In the case of “municipal housing", the town acquired funding of 30% of the investment value from the government's Subsidy Fund, from Bank Gospodarstwa Krajowego. The flats will be allocated to applicants on the basis of the rules specified in the resolution of the Town Council. Details on older people's involvement: Seniors played a consultative and informative role in the project. The purpose of the modernization of two apartment buildings in Ostrów Wielkopolski was to adapt the flats to the needs of seniors. On several occasions, seniors asked the local authorities to exchange their large, expensive and not accessible flats for smaller ones with lower costs and central heating. Projects concerning the creation of sheltered housing and municipal housing adapted to the needs of seniors and people with disabilities are new. However, it can already be concluded that the project enjoys high social recognition, especially among seniors. It is widely promoted in local media (press, TV, social media). The form of the financing of the project is also well received. The town acquired external funds for both tasks, which allowed local authorities to carry out the project with their own resources, which significantly relieved the town budget. The authorities of Ostrów Wielkopolski are going to develop age – friendly policy and this practice. Two strategic documents which define direction of action, adopted in November 2017 by the Town Council will underpin the practice. The first one is the resolution which introduces the "Multiannual program for management of the housing resources of the Town and Commune of Ostrów Wielkopolski for 2018-2022". After 2,5 years, this program, in accordance with the document, will be verified. If it turns out that there is a further need to build or reconstruct the existing housing stock of municipal housing, this direction will be maintained, and further municipal flats will be built. Detailed principles concerning ways of providing flats are specified by “Resolution in respect of specific rules of renting municipal flats that are in the housing stock of the Town and Commune of Ostrów Wielkopolski”. Every practice, especially in the context of senior policy, is a new one and at the implementation stage the town faces many challenges. The most important lesson drawn from the implementation of age-friendly practice is to best define the target group and to adapt a given practice to the needs of recipients of these activities. The biggest challenge of the project was to find a convenient location for the buildings. The town authorities wanted to build apartments in the city centre, in a convenient location (close to shops, park, bus stop).